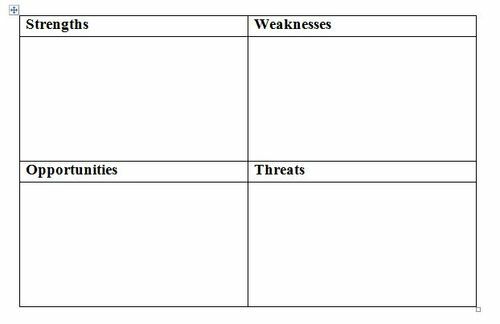 The SWOT analysis is often used to help individuals consider the current position of the organisation from the standpoint of demonstrable strengths, inherent weaknesses and the opportunities and threats being faced. However, the same process can work just as well for an individual facing any type of life challenge or change as it can for an organisation. For example, if a client is thinking of setting up in self-employment or is considering the way that they are perceived in a particular situation, like starting a new job, it can help the individual explore aspects he or she may not have considered previously. It is most useful if the Coach divides a piece of paper or flipchart into the four boxes as outlined below so that the client can take this away with them. The Coach is then able to facilitate the client’s thinking by getting the person to brainstorm the relevant items for each of the four boxes. It works best if the coach writes down what the client says to allow the client the freedom of focusing solely on their thoughts. 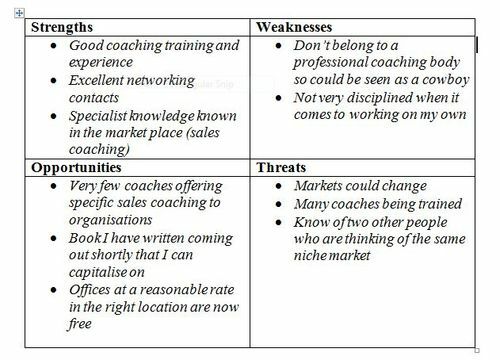 For example, if the client is considering setting up his or her own coaching practice the SWOT might look something like the following upon completion. Using the SWOT analysis means the Coach and the Client can discuss each of the relevant areas and set about evaluating how much strength, weakness, opportunity or threat each item contains and what subsequent action planning needs to take place. A series of goals will then naturally arise from this exercise which prepares the individual for the challenges that lie ahead (Caplan, J, 2003). In addition, this exercise also provides an opportunity to discuss the personal values the individual ascribes to their situation (Csikszentmihalyi, M, 2002). Once the client has been through this exercise once he or she has a structure that can be applied at any time in the future (Hurd, J, 2003). The SWOT analysis is an excellent example of a tool designed for one purpose, to improve organisational profitability and productivity that can be used creatively in a personal as well as professional way.